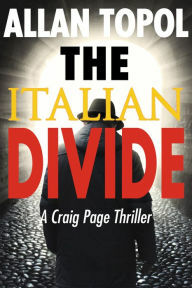 The Italian Divide: A Craig Page Thriller. Allan Topol. SelectBooks, Inc. March 16, 2016. 304 pp. ISBN#: 9781590793411. Former CIA Director Craig Page has reinvented his life after being involved with an international conflict that caused the death of a family member and also being responsible for the death of a Chinese leader’s brother. Now Page, after undergoing drastic plastic surgery, is famous as an Italian racecar driver, Enrico Marino. His love of the sport has made him happier than he has been in years. However, that new life is about to undergo a major disruption as a result of the death of a Florentine banker and friend, Frederico Castiglione. Page speaks to a friend of Castiglione, an Italian banker, Andrew Goldoni. The two bankers had been first politely sell a large percentage of their bank shares and then threatened with physical harm if they refused. The coercion is first carried out by Chinese agents and then Russian muscle men. Page decides he owes it to Castiglione to prove that his death was not a jewelry heist gone awry. His suspicions grow stronger after learning that an Italian politician, who is running on a ticket advocating that Northern and Southern Italy become separate independent states, is involved with strange bedfellows lending him money in return for ignoring Asian takeovers of Italian businesses. It’s an unhappy and violent turn of events that Page is insistent on proving, coupled with an unspoken desire for revenge on Zhou Yun. Page is assisted by two CIA agents and a counter-terrorism director. The criminal elements underestimate Page’s perseverance in uncovering the crime with severe ramifications for the governments of Italy, America and eventually the world To say more would spoil a phenomenal international thriller plot that twists and turns in unpredictable ways that leave the reader exhilarated and anxious to learn the end that could be a blessing or could be an international calamity. Alan Topol writes with shades of style comparable with the old novels of Robert Ludlum and Frederick Forsythe. Just when the tension ratchets up to what feels like a climactic turn of events, the plot thickens even further. The Italian Divide… is an international thriller of the highest order, one which this reviewer eagerly recommends for those who love this dynamic genre of writing.